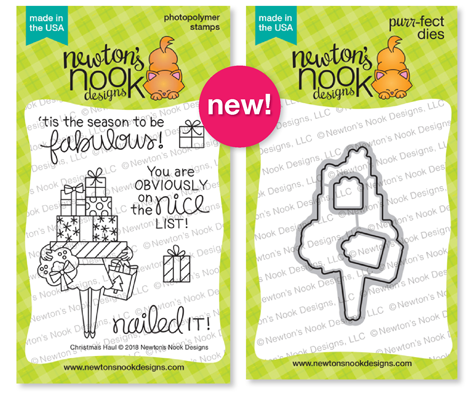 Newton's Nook Designs: November Reveals - Day 1 - Christmas Haul, Moose Mountain, Snowman Advice + NEW stencils! November Reveals - Day 1 - Christmas Haul, Moose Mountain, Snowman Advice + NEW stencils! This is our second post today! To see an adorable card by our Guest Designer, Kelli Cool, scroll down or click here. Today is our first reveal day for our November Release and we're sharing three new stamp sets and two new die sets plus our new layering stencils today! We have a giveaway too so make sure you read all the way to the bottom of this post to see how to win! 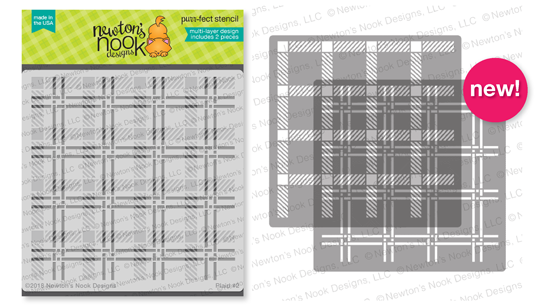 Create beautiful two color patterns with our NEW 2 piece layering stencil designs! Use one stencil to add the first pattern then remove and use a different color to add the second pattern to create a two color design! Both stencils include etching of the opposite layer so they are easy to line up. 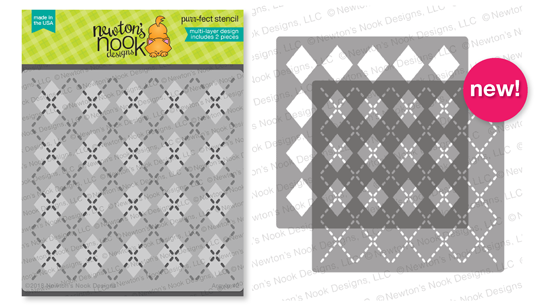 Perfect for creating cozy argyle and plaid backgrounds for winter and holiday cards! 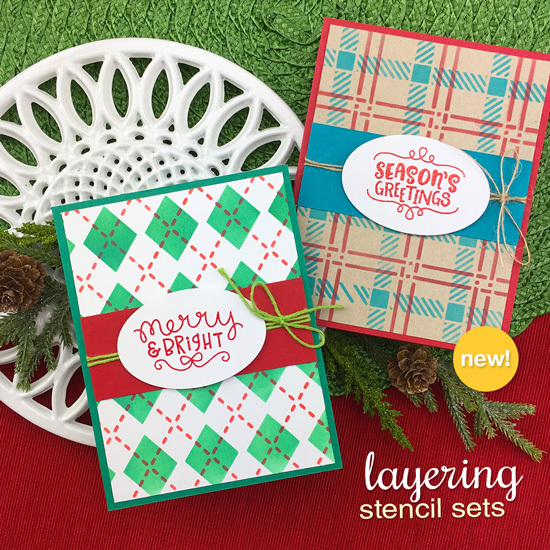 Each stencil set includes two 6 x 6 stencils that can be combined to create a layered design. Be fabulous this christmas! This cute 3x4 stamp set features a lady who has her christmas shopping all accomplished! She's holding a huge stack holiday gifts and a wreath too! The sentiments included are so fun for sending cheerful holiday greetings. Add more gifts or create backgrounds with the two little extra gift images. Make the MOOSE out of life with this fun 4x4 stamp set! This set features an adorable moose with his snowboard! This unique design is perfect for winter sports enthusiasts and more! Add in the fun sentiments and you have adorable cards that are perfect for sending fun and inspirational wishes! Send advice from the a snowman with this 3 x 4 stamp set! This little set is packed with wonderful snowman themed images too! It features a fun inspirational sentiment and images of a two snowmen and snowflakes! Try using the sentiment for the focal point of your card and creating fun backgrounds with the smaller images! Get inspired with amazing Holiday and Winter cards by our Design Team using these new products! 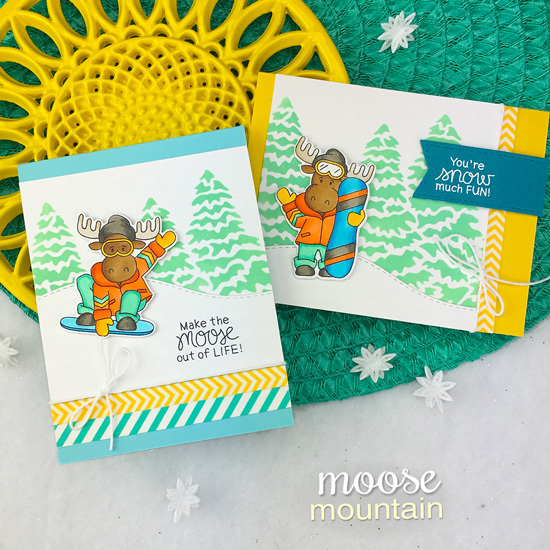 Tatiana created this adorable snowboarding moose card using NEW Moose Mountain Stamp Set with fun vibrant colors! She added that amazing background plaid using our new Plaid Stencil Set, adding the second layer twice in two colors to get the extra stripes! Juliana created this gorgeous Christmas card using our new Christmas Haul Stamp Set. The pop of bright red and green really goes great with the black and white! Such a fun and modern look and perfect for the holidays! She also used our Framework Die Set for the scallop edged panel. This festive winter card by Amanda features several of our new products! She featured the adorable moose from the new Moose Mountain Stamp Set and added in a tiny snowman from the Snowman Advice Stamp Set and a tree from our Forest Scene Builder Die Set. For her background she created stunning red and black paid using our new Plaid Stencil Set and added snowflakes on top from the Snowman, embossed in white! This cheerful Holiday card was created by Samantha using our new Christmas Haul Stamp Set. She colored the girl and her gifts in fun bright colors and added adorable stripes to her stockings! For the background she used our new Plaid Stencil Set to create a subtle texture and added bright yellow hues over the top! Perfect to cheer up a cool winter day! 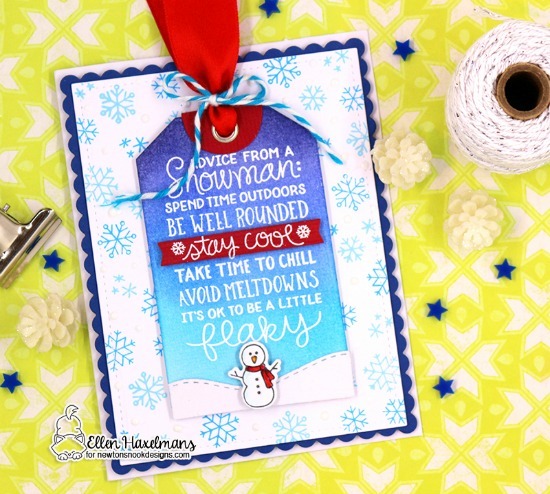 This lovely card was created by Larissa featuring the big sentiment from our Snowman Advice Stamp Set! She framed it inside a scalloped edge frame from our Framework Die Set and added the cute little snowman in the corner. For the background she created that gorgeous pattern using our new Argyle Stencil Set. She used each stencil twice to create diamonds in two colors and stitching across the middle and along the edge of the diamonds! So cool! Zsofia created a delightful duo of snowboarding moose cards using our new Moose Mountain Stamp Set! She colored the outfit on each snowboarding moose awesome bright colors and made background panels to match the colors! For the backgrounds she used our new Argyle Stencil Set, inking the diamond layer twice to create the fun multi colored look! She also added on the sentiment into a banner from our Frames & Flags Die Set. This Holiday card by Naki has so much sparkle and glamor! She used the girl with all the gifts from our new Christmas Haul Stamp Set, coloring her with fun bits of gold! Then she used each of the stencils separately from our Plaid Stencil Set to create fun modern background patterns that she layered onto her card! She added the sentiment in gold onto a postage edge tag cut using our Framework Die Set. Maria created a winter wonderland for the snowboarding moose on her card! 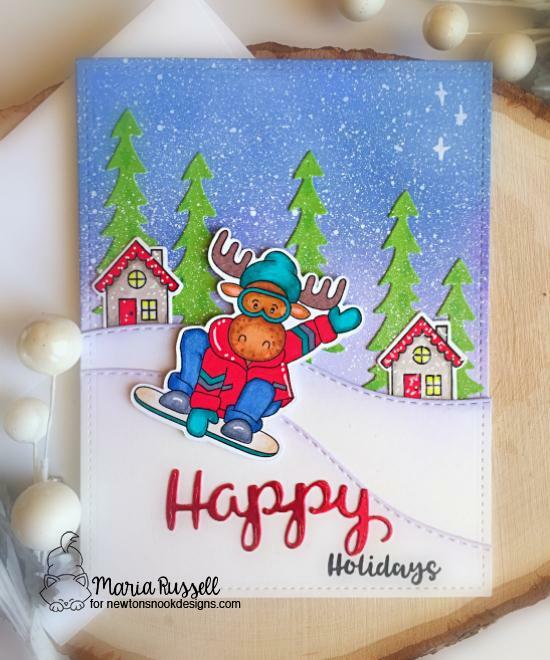 She used the moose from our new Moose Mountain Stamp Set and created hills of snow for him using our Land Borders Die Set. She then added houses in the background using our Snow Globe Scenes Stamp Set and trees using our Forest Scene Builder Die Set. She finished out the card with a die cut "happy" from our Holiday Greetings Die Set combined with the word "holidays from our now Globe Scenes Stamp Set. 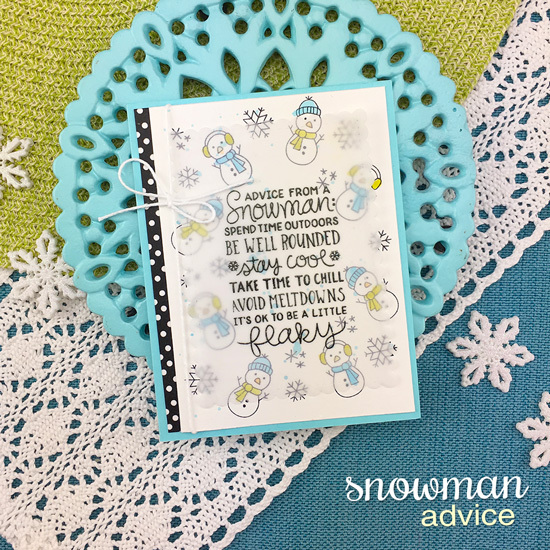 This adorable Snowman card was created by Holly using our new Snowman Advice Stamp Set. It's so cute how she used the little snowmen along the bottom and masked them to overlap together! She also used our Framework Die Set for the stitched edged panel. Would you like to win a $25 store credit to Newton's Nook Designs? Here's how to win: Comment on the NND blog and Design Team blogs (see list below)! The winner will be chosen at random from the collective reveal posts. Make sure to check out each of their blogs and comment for your chance to win. You will not know which blog has been chosen so the more you comment on the better your chances are of winning! You have until Wednesday November 21st at 9pm EST to comment -- winners will be announced on the blog post on Friday, November 23rd. So in loooove with your new stencils....they seem amazing! Beautiful release!!! My fave is the moose stamp set!!! Jen, I love your cards, the tree stencil behind the moose is awesome..and your Snowman Advice card is really cool how you created a circle of snowmen!! What a fabulous release and gorgeous inspiration! Love that adorable moose and the plaid stencils are sure to be a staple. Wow!!! So much talent in 1day! 😍😍😍 The two layer stenciling genius can’t wait to give it a try I could never pick a favorite designer card but my favorite stamp that has got to be the Moose set!!!! 😍😍😍 or is it Moose’s 😉❤️ Thanks for the chance to win! I am so excited! What a great day 1, so many goodies! Wait, I want them all!!!! The Moose cracks me up! Everyone's cards are super Adorable! Love them all! I love the new stamp sets and stencils are Amazing! Enjoyed the day's creations. Especially like the Snowboarder Moose. is pretty funny, too. Gonna be another great release! Oh, that fab argyle sweater stencil and uber cool snowboarding mooose!!! Those background stencils are fantastic!!! Can’t wait to see the rest of the release!!! What a great way to start the week, new cards & stamps from Newton's Nook - yay, leftovers & shopping on Friday at my favorite website! I really like the new stencils, and that moose stamp is so cute! I'm very excited for this release and I'm loving all these great cards shared today! The stencils for the background look AMAZING. I would love to see a VIDEO on using them in case there are any good tips I should know. Great release & awesome inspiration! Really like the new stencils. So easy to make outstanding backgrounds. And the holiday shopper is priceless! Cheers. Love the new stencils!!! and the snowman advice is to cute!! Fun new stamps and dies! Snowman Advice is my favorite! I love these new stencils! Gosh - I love it all. Great release and and amazing cards! Wow. There are so many great new products here. Love them all! LOVE LOVE LOVE those stencils! Awesome new release! Such fun designs! 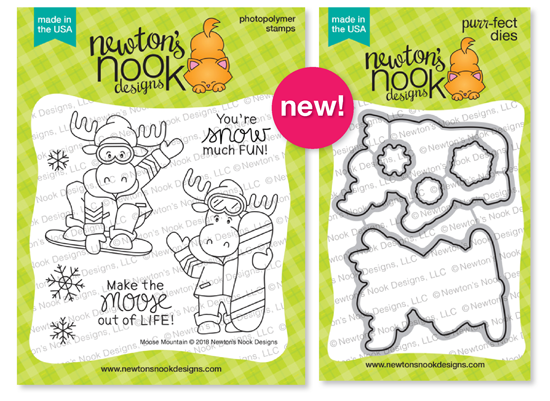 Love the new 2 part stencils & the cute moose & snowmen! 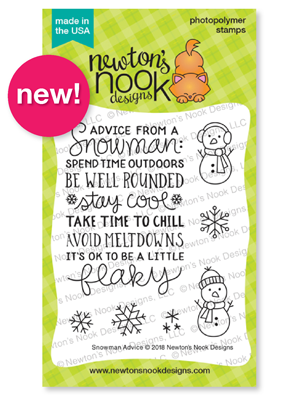 Love the new stencils and the snowman advice stamp! Those layering stencils are just so stinkin' cool. 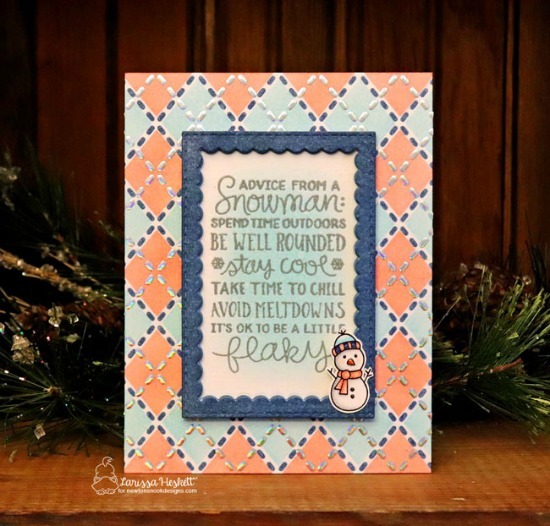 Oh, how I love the two layer plaid stencil and the wonderful snowman advice! You guys nailed it! I love the new products! The layered stencils and fabulous and I love Moose Mountain! Oh my gosh, you've outdone yourself again. I absolutely love the stencils. It's so cool to see all the colors used in these cards. Can't wait to see them. and so nice inspiration projects from team! I want it all! Those cards are all so cute! So I am now off to hop! 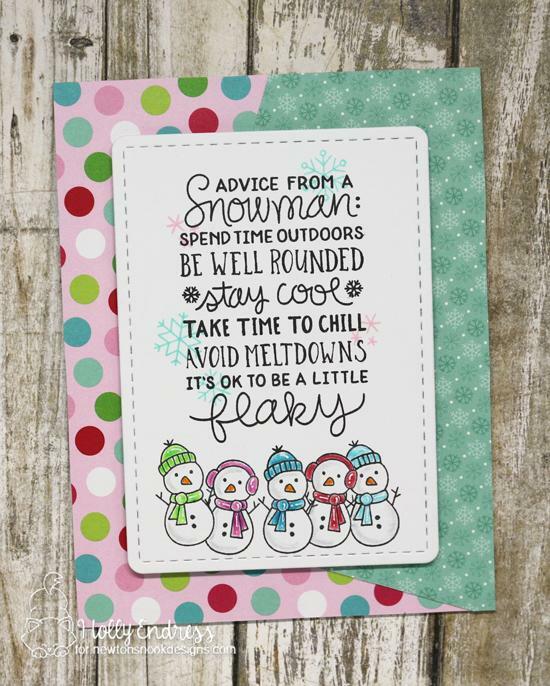 ❤ all the new products but especially advice from a snowman. So stinkin' cute! I'm putting those plaid stencils and the snowman in my cart ASAP! This is a terrific release and the projects are wonderful! I haven't used stencils very much, but that plaid one looks especially fun. Looking forward to the hop! I especially love this release! The cards will bring much joy to the recipients this Christmas!!!! Love, Love, Love- the Wishing you Joy set!! Love the plaid and the argyle.